Seen Juhi Chawla Dancing To Deepika Padukone's Ram-Leela Song Yet? The medley starts with a song from Kai Po Che! The ever-vivacious Juhi Chawla was recently seen dancing to a medley, which included one of Ram-Leela's foot-tapping numbers, picturised on actress Deepika Padukone. Posting a video capturing the joyous moment on Instagram, she wrote, "At a friend's son's celebration last evening, what a lovely time." 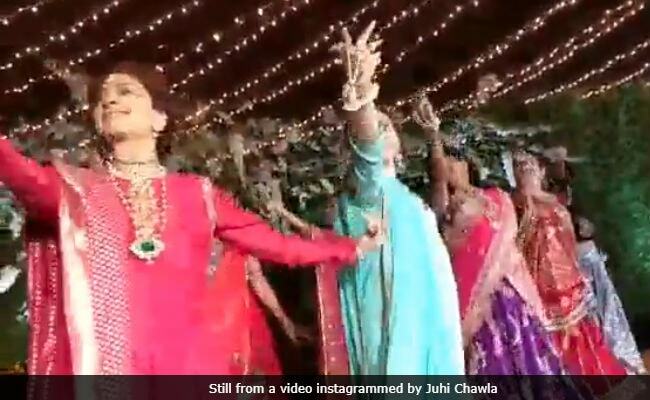 Juhi Chawla dancing with her friends is all of us. She was last seen in Chalk n Duster (2016), and is currently busy with an untitled project. During a media interaction with the 'Citizens For Tomorrow' initiative, last month, she said, "I will start shooting for a film in December. It's a very interesting and beautiful script. I can't divulge much detail about it as of now because the production house of that film will make an official announcement about it. But it's going to be a lovely film and I can guarantee this to my audience." Even Miss World 2018, Manushi Chhillar picked Deepika's Nagada Sang Dholfor her introductory performance at the international beauty pageant. The official YouTube channel of Miss India competition posted Manushi Chhillar's performance, which has more than 2 million views. Nagada Sang Dhol is a popular Garba song from the 2013 hit Ram-Leela, directed by Sanjay Leela Bhansali. The song features Deepika Padukone performing some heavy-duty dance steps. Deepika Padukone was rumoured to have used a body double to shoot Nagada Sang Dhol, which she vehemently refuted saying, "Who is spreading these rumours? You want to see the sores of my feet? How badly the skin has come off? I've worked very hard, don't take away the credit," Indian Express reported. Deepika Padukone and Sanjay Leela Bhansali have teamed up for the third time in Padmaavat, which will release on January 25.